Our story focuses on an older lady living in the desert and running a makeshift museum of hundreds of robots built by mad scientists and taken down by superheroes. But in fact, Ellie is some sort of mechanical genius, and she’s managed to rebuild and reprogram all of them. Her hard-luck nephew Fred comes to visit and tries to make the museum profitable — and he’s willing to use less-than-legal methods to do so. But what is the strange secret Ellie is hiding inside her age-addled mind? Verdict: Thumbs up. It’s an intriguing mystery, with several interesting characters. 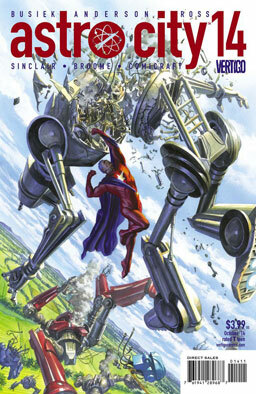 We also meet some new superheroes from an obscure superteam. And so many robots! Robots are always a good thing. J’Son, the despotic ruler of the Spartax Empire, plans to kill everyone on the planet Torfa to cover up the vibranium he’s mining there, and the vibranium toxicity that’s poisoning everyone who lives there. 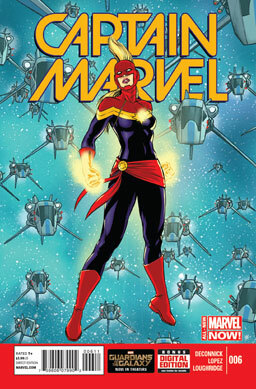 Captain Marvel fights off his fleet while the rest of the refugees on the planet below work on a plan to save everyone. Can they keep J’Son from wiping everyone out? Can they expose what he’s done to the rest of his empire? Verdict: Thumbs up. Great art and a great story — it reads like the last reel of a really fun action movie, and there aren’t that many comics that can pull that off nearly as well as this one does it. On a related note, America has been a very racist nation for a long time, and seeing so many people embrace that like it’s a good thing is intensely frustrating. And on a similarly related note, the depressing secret they never teach you in history class is that the South actually won the Civil War, and the news refuses to talk about the fact that the Tea Party is ultimately an anti-American movement. The roleplaying game industry and GenCon have their own problems with race and diversity. Okay, fine, one funny link for you: 100 actual titles of real 18th-century novels.